I've been playing enough games with WSAD camera controls (eg. Neuroslicers, Oxygen Not Included), which has given me the urge to try it out in ZK. Here is my current setup. I know some other people have switched to WSAD. Did it work out? By editing LuaUI/Configs/zk_keys.lua I am able to set the order that conflicting actions occur. The order of the actions is reflected on the image. For example, the first 'R' press activates the Reclaim command. Subsequent presses of 'R' alternate between Reclaim and Repair. All changes, apart from setting activation order, were possible through the ingame UI. Activating a construction tab overrides the camera controls, which is fine. Stop is Ctrl+S. Area Attack is still Alt+A. 'T' is Attack Move in Starcraft II grid keys, so I have some practice with it. Most of the changes simply shuffle keys sideways to make room for the camera controls. The other thing I am trying is moving Jump from 'J' to the same button as Manual Fire. I'm confused as to how does having Force Fire Manual Fire and Jump work on the same button when you are using a Recon Commander / Pyro / Etc with a Disruptor Bomb? Not force fire but manual fire like dante's salvo? Force fire is shared with guard. Regarding key binding: is there a widget that displays wirtual keyboard and amount of stuff that is bound to each key (which changes when you press modifiers like ctrl/shift). I really need to reorganize my controls, especially to include some custom commands. Some of unpopular commands I'm using are deselect half, deselect above 60% health. I want to include toggling fire state. How does reclaim and repair work on the same button? I've played with WASD camera controls since I started playing Spring games basically. It is a lot of work to make it work out. If you say please, I might have the energy to map out my keys. The order of the actions is reflected on the image. For example, the first 'R' press activates the Reclaim command. Subsequent presses of 'R' alternate between Reclaim and Repair. I'm confused as to how does having Manual Fire and Jump work on the same button when you are using a Recon Commander with a Disruptor Bomb? Same mechanic as the above. Press F. Your mouse is now a targeting reticle for D-bomb. If you click somewhere, bomb's away. But don't click and press F again. Now your mouse is a targeting reticle for the jump. Click somewhere to jump, or press F again to cycle back to D-bomb targeting reticle. I also had to move the units tab hotkeys from WSD. 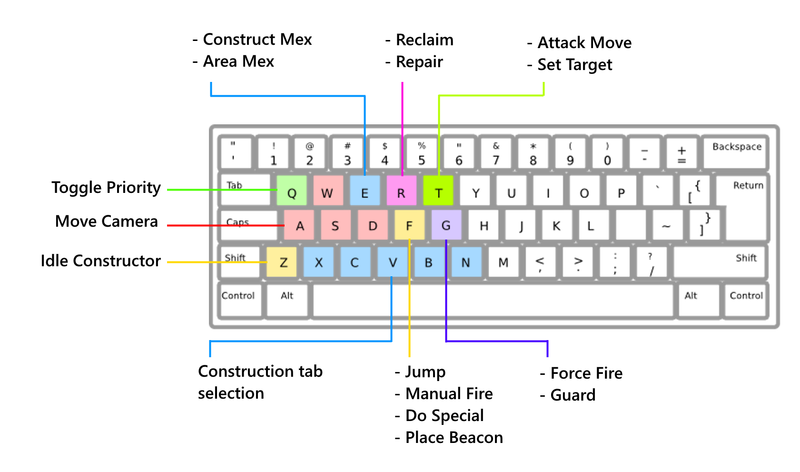 I only really use the hotkeys for constructors and raiders, so this layout should work. Welp, i still sometimes do CX instead of XC; FF for jump with F and FFF for dgun would mean ded com.